"Your carry-on packing tips helped me so much on this trip. We hope our carry-on packing tips will help you streamline your packing too. We're not saying pack a big suitcase to check AND a carry-on. ...then thank us for making that the rule. Believe it or not, we think if our carry-on packing tips can show you how to travel light, it will make your travel experience better too. Below our carry-on packing tips, we'll tell you WHY we think traveling light makes a trip better. We have several pages with details on our carry-on packing tips and lists of what you might want to take for each trip. Check "Navigate Our Site" over to the right. Always pack clothes that mix and match. Color coordinate your wardrobe; almost everything should go with everything else. Your travel clothes should be easy to wash and dry quickly. You don't need an outfit for every occasion... Are you going to use or wear something often enough to carry it around for your whole trip? Try to limit yourself to two pairs of shoes. --Will a tablet do instead of your laptop? --Will your phone work where you're going? Remember to carry the proper adapters and converters for what you choose to take so you can plug them in to charge them. Learn how much you can fit in your one quart plastic bag. Depending on the trip you will want to take a small flashlight, a first aid kit, sun screen, insect repellent. Check our packing lists for specific types of trips... after all a safari requires different clothes from a wine tasting trip to France ...and from a beach vacation in the Caribbean ...and from a cruise. Remember you can and should wear layers onto the plane. If you're going to cold weather, you're not going to pack your coat and heavy sweater.... wear them! Pack clothes that blend in at your destination. No need for flashy designer fashions... it could just set you up as a target for pickpockets or thieves. Leave your jewelry, expensive watches and designer sunglasses at home. I wear only a narrow gold band and a $10 travel watch. And if you have only carry-ons, you look less conspicuous. Security alerts have changed the way you should pack. Follow our carry-on packing tips, but ALWAYS check for the latest information on what you may take on board, listen to the news, check with your carrier, and look at our Travel Security Alert Packing Guide. Those security regulations do change from time to time. What if you have to check it anyway? With crowded planes these days, you just may even have to end up checking your carry-on size bag, but we still encourage you to pack light because it will make the rest of your trip easier. Every traveler and travel writer out there has their own helpful carry-on packing tips. ...No, you don't have to weigh yourself, but the more you pack, the more your luggage will weigh. 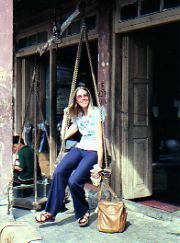 The one thing everyone agrees on is that to enjoy the trip, you must travel light. This goes for anywhere you go... and for almost any length of trip. The most basic reason for this is that it's easier to carry and keep track of all of your travel belongings if you have only one carry-on and a "personal item". Make sure your bag is the right size for carry-on. Airlines may let a larger bag slide sometimes, but not always. 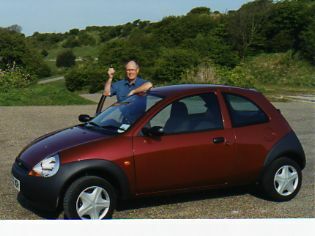 If you're renting a car, remember that in most countries you want to rent a small car just to negotiate the narrow roads in and around those small villages that are so much fun to visit. Visualize the size of the trunk of one of these small cars, and you'll have another reason to limit your luggage to carry-on size! Sometimes even fitting four pieces of carry-on luggage into a trunk is like putting a jigsaw puzzle together. Carry-on packing tips to the rescue again. If you're taking trains around Europe, you'll be in and out of stations, on and off platforms, up and down train stairs and lifting those bags into overhead storage. Once in town you'll be walking--with your bags--your carry-on bags--to your hotel or you'll be negotiating a subway or bus to get to your lodging. Are you throwing things out of your suitcases yet? 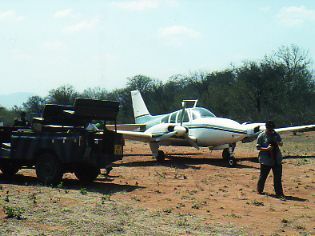 If you're going on safari in Africa or flying in a small plane to a jungle lodge in South America, it's very likely that you will have restrictions on the size, weight and number of bags you can take with you. 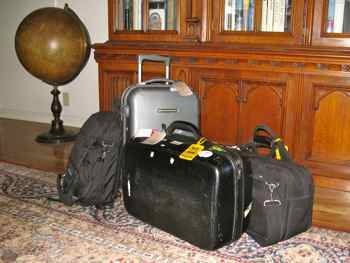 If you're going on a trek in the Himalayas..., well you get the picture.... Carry-on packing tips help out again. If you have too much luggage, you're apt to be sitting on it! 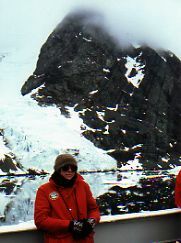 Once when we went on a month long cruise to Antarctica. We needed wading boots and splash pants for the zodiac landings, not to mention layers of sweaters and parkas... too much for just the carry-ons. Our Cold Weather Packing List will give you an idea of what to take. 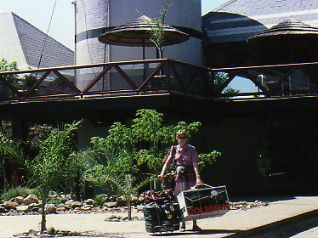 The second time was when we went on safari with a friend in Botswana, and he asked us to bring him an eighty quart ice chest!!! Even if things had gone smoothly, that would have been a lot to carry around... but things did not go smoothly. We were in and out of a variety of planes, through security and customs in several countries, and on and off several buses and vans before we were finally able to deliver our cargo... and that's what it felt like... cargo! But that's a story for another time. For now, just remember this mantra... one carry-on each... follow our carry-on packing tips.... pack light, pack light, pack light. Hopefully I've got you convinced that carry-on is the way to go... now exactly how do you accomplish that? That's where our carry-on packing tips come in. Carry-on Packing Tips -- What Size IS Carry-on? Not what I was carrying in Botswana! Here we CAN only give you carry-on packing TIPS! This varies from airline to airline. A basic guideline is that your bag should have a total dimension of 45 inches.... that's height + with + depth. So, for instance, it could be 22" x 14" x 9". If it needs to go under your seat, it will probably have to be smaller. There may also be weight limitations that vary by airline. And the rules can change if there is bad weather or heavy loads on the plane. You should check with your airline. International limits can be more stringent. In the United States, you're allowed one "personal item" in addition to your carry on luggage. We have more details at What Is Carry-On Size. Also see What Do Airlines Consider A Personal Item? Then remember, you should always check with your airline. 2--Take Pepto Bismol... I do testimonials for Pepto Bismol, read more about the fun we have with that. It's a serious tip though. If you must check your bag... carry important papers with you. Try not to check anything you can't afford to lose....... cameras, computers, medications. Depending on the world situation, security alerts may dictate what you can take onboard and what you must check. Packing your medications and prescriptions has changed because of security regulations. Security experts generally say not to put your home address on your luggage. We actually break this rule, but it is best to use covered luggage tags. We write our address inside the luggage too, so if the tag is ripped off, officials can open the bag and find our information. Stay with your luggage at all times. If you are required to check it... stay with it until it is checked. Keep your carry on luggage close and be aware that distractions could be ploys to divert your attention and allow an accomplice to make off with a bag. If you're paying "sky's the limit" prices, this advice might not apply, but we travel with a modest budget, and we can't afford to pay an entourage to carry mountains of luggage around for us. Now that you've got those carry-ons packed, check on our Health tips, Travel safety tips, Money Matters, Passports and Visas, Transportation tips, and the testimonial I do for Pepto Bismol! Click that mouse and see what we have to say on those matters. Links to those in the navigation bar to the left.